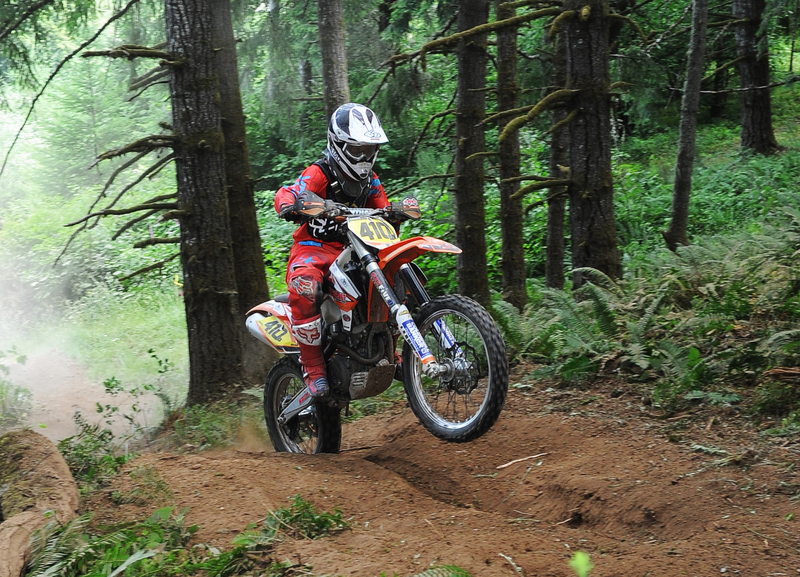 Elkton, OR: This summer the KENDA/SRT West Hare Scramble Championship headed to it’s Northern most round in the Mountains outside of Elkton, OR. 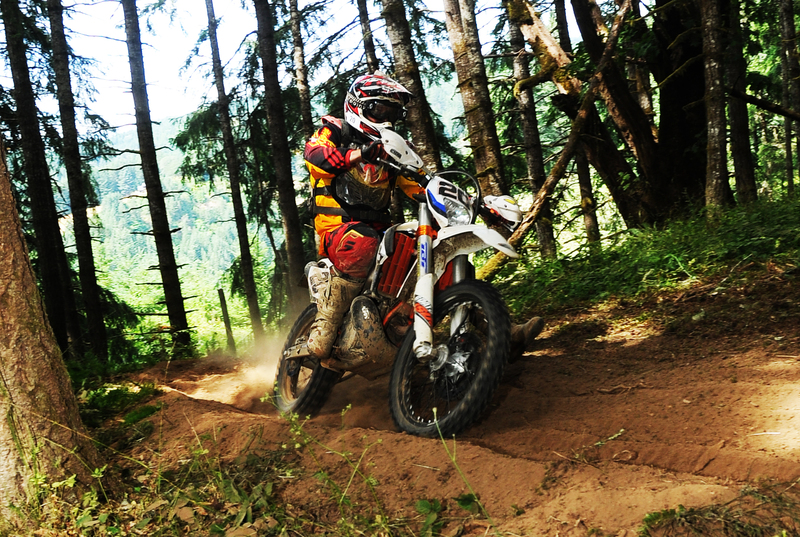 The Big K Guest Ranch is home to what many racers consider to be the “classic” hare scramble course all in the trees, all single track and all on private property. 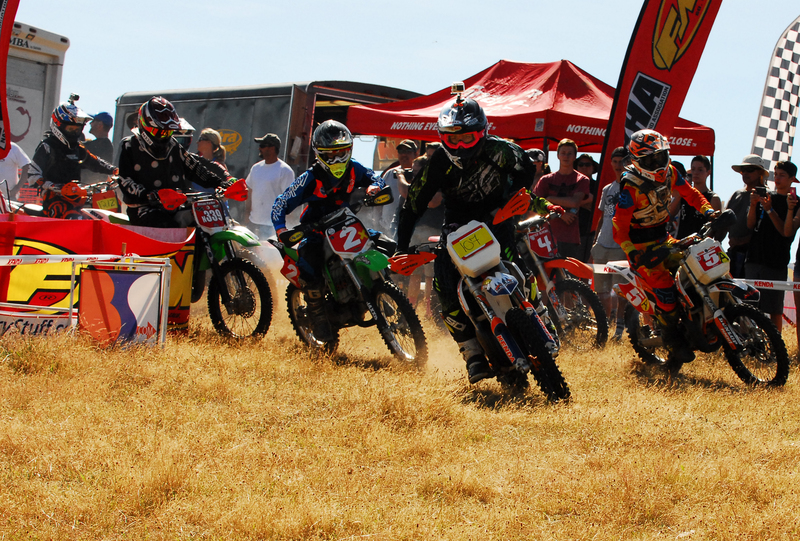 ETRA hosted the 2 day event that was more then successful with over 360 riders lined up to do battle over the weekend! 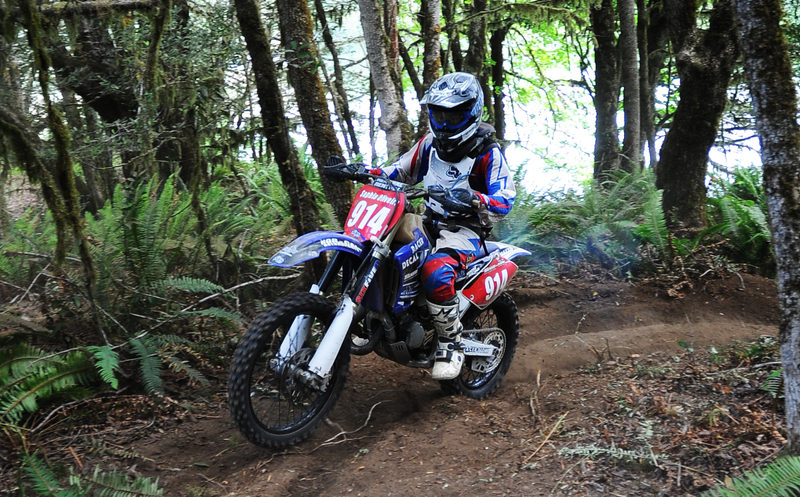 After the long drive through the mountains and up to the top of the staging area the riders were greeted with one of the most amazing views of the Umpqua River and the first riders to take to the trails were the 4-8 year old Pee Wees aboard their 50cc machines! At the drop of the green flag they were off and BOTH Vacaville, CA’s Zach Scarpulla and San Jose, CA’s Elizabeth Edwards would grab the Batterystuff.com holeshot award onto the 2 mile course. Zach would take over the lead and would lap every single rider in the field! 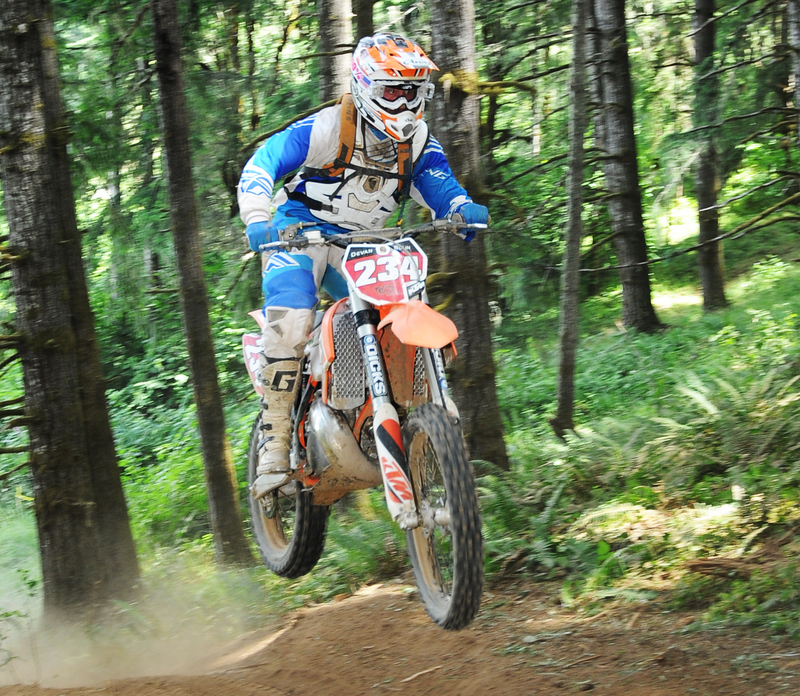 Elizabeth would hold on to finish 2nd and would also lap everyone behind her and was followed by Coquille, OR’s Mackenzie Cook. >>Zach Scarpulla took the first win of the weekend. 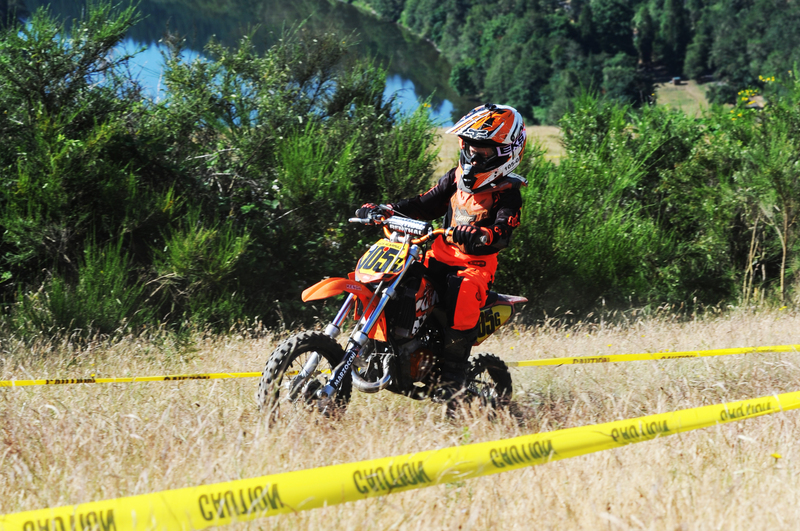 The next race to line up would be the fastest youth racers in off-road with the the Super Mini’s, Mini’s and girls. Fly Racing’s Austin Philips would nab the Batterystuff.com holeshot with a handful of throttle while standing up through the corner and would lead the riders into the woods. Series points leader Mach 1 Motorsports backed John Modena would make quick work of Philips moving into first before the end of the first lap while Philips would lose a battle with a tree and have his work cut out for him the rest of the day eventually finishing 8th. Modena would go on to take his 3rd victory of the season. 707 Racing’s Lochlan Campbell would battle through the field from over 5 minutes behind Modena to finish 2nd just 2 minutes and 23 seconds back followed by another 707 racer Mason Parker just 55 seconds behind. The Mini class would once again be dominated by T.O. Powersports backed Mason Matthies nabbing the holeshot and leading wire to wire. he would also finish 6th overall against the big bikes and the girls making for one of his best finishes to date! He would be followed by Clint French of Washougal, WA and Michael Oliveira of Laselva Beach, CA rounding out the Mini Podium. Ava Silvesrti would once again take the Girls victory putting her just 2 points behind friend and main competition Bailey Rhodes once “throw-aways” are taken into account. As we have said over and over this battle will go all the way to the final round with only 2 rounds to go. Maddison Freitas of Grizzly Flat, CA would finish in between the two ladies in 2nd making for her best finish of the season so far! The final youth race of the weekend would see the Jr. Mini’s and Micro Mini 65’s take to the course for an hour and a half. The first row would be dominated once again by 707 Racing’s Logan McChesney who is now only 6 points away from wrapping up his first National Championship. He would get the Batterystuff.com holeshot and would never look back. 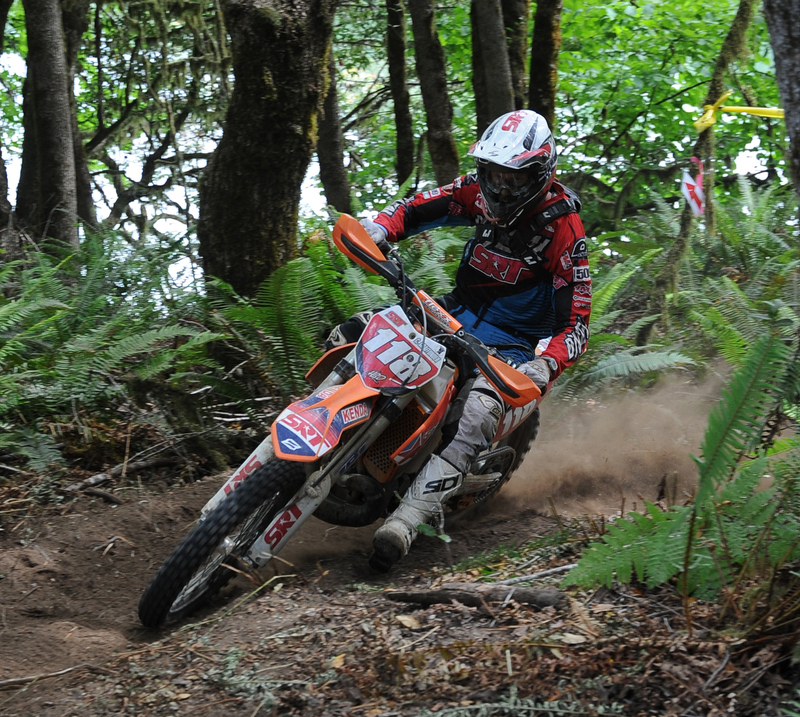 3 Bro’s Husqvarna’s Eric Burdell would have one of his best rides of the season while taking his third runner up finish. “I felt really good out there!” Said Burdell “I’m not super good in the trees but it just cllicked for me!” 8 Minutes back Benjamin Edwards of San Jose, CA would finish 3rd making his second time on the podium this season.The Micro Mini class has already been wrapped up by Zeke Degeyter and with this being his local round he was the odd’s on favorite for the win and he would not disappoint. While Wyatt Mattoch of Boulder Creek, CA would take the holeshot, Zeke would make quick work of Wyatt and would take the win by just under 5 minutes. Lane Forbes would make the long trek north for the event to take another 3rd place on the season and left with a huge smile on his face as usual! 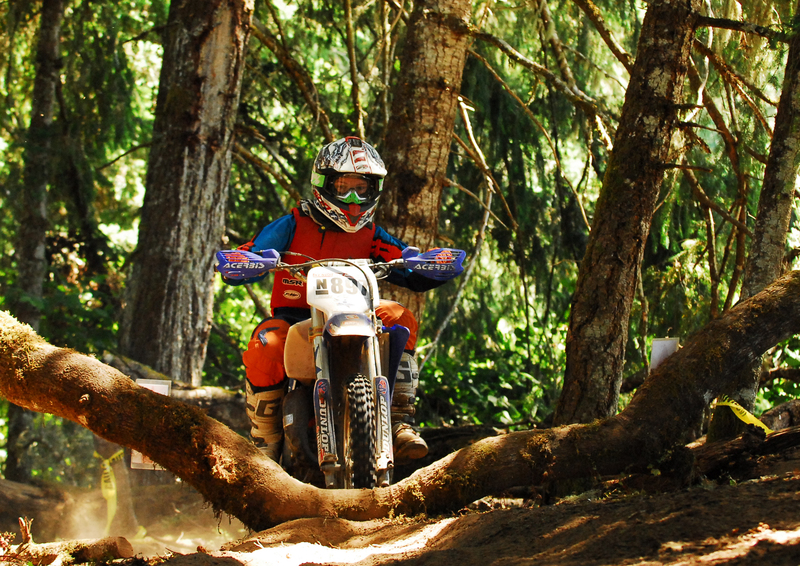 >>707 Racing’s Logan McChesney is seemingly unstoppable this season. The final race of Saturday would see ALL of the C classes and the Masters 60+ racers line up to take on the full course. 14 miles of tight trees, water crossings, the wood matrix at the halfway point, the iconic “100mph Hill” and “:Log Deck” just before the finish. The first line to take on the entire package and Scott Getty would get to the first corner only inches ahead of Jeff Durkin but Durkin would get out front before the next corner when Getty would slide out in the grass. Durkin would go on to take the overall victory handily but the real story was the race going on behind him! There were 2 big battles going on; first between the C 200 racers Hayden Hintz who had taken the Round 5 overall win and Super Mini Holshot winner Austin Philips would would also take the holeshot in the big bike race. Hintz would work his way up from 3rd to 1st taking his second class victory in a row finishing 3rd overall C. The next battle would be for the Masters 60+ win. Into the first corner there would be chaos with first and second in points racers Larry Klienschmidt and Wes Anderson Jr. colliding and ending up in a pile in the first corner. Both racers would get up slowly and while Anderson would have to pull out with a broken rear brake caliper Klienschmidt would change his goggles after his lense broke out. Once he got going again he would make his way to the lead in just one lap! He would go on to take the 707 Racing Suspension overall Award and the win after the crash and was beat up but more then happy to take another win! Sunday would see only 1 race – the big one! All Pro, FMF Pro 250, A and B riders. At this point in the championship there have been 4 different winners in 5 rounds, Purvines Racing’s Nick Burson being the only 2-time winner to date, and many racers that have been very close so it seemed to be anyone’s game. Three time winner Rory Sullivan of Motorsport.com was the odds on favorite to win but had spent little time getting ready for the race and was admittedly not ready for the weekend, but that’s how he is every time! With lots of other local racers ready to throw their hats in the ring it was going to be a great battle to be sure. Into the first corner local racer Devin Bolin would push everyone wide and nab the Batterystuff.com Holeshot while Burson, Justin Bonita and many others who took the outside would be mired in the dust. There was lots of shuffling going on over the first few laps but series points leader SRT Off-Road’s Cory Graffunder would make his way to the front when Bolin would take a spill on the first lap. Bolin would keep Graffunder honest the first few laps keeping within 40 seconds but could never get close enough to make a pass back and admitted “I really never expected to do this well. I was just wanting to get a top 10 but being in the lead group was awesome!” said Bolin surprised even at himself. Graffunder would have an uneventful ride putting in solid laps for the entire 3 hours and 29 minutes that the race spanned extending his points lead to 26. >>Devon Bolin would finish 2nd overall as the top finishing local racer. Many racers would take the 3rd position over the span of the 3+ hour race but none seemed to be able to hold onto it. Round 4 winner Vaughn Wilk would be in 3rd until he hit a tree and had to pull out while Round 2 3rd overall finisher Justin Bonita would inherit the position but suffer the same fate. 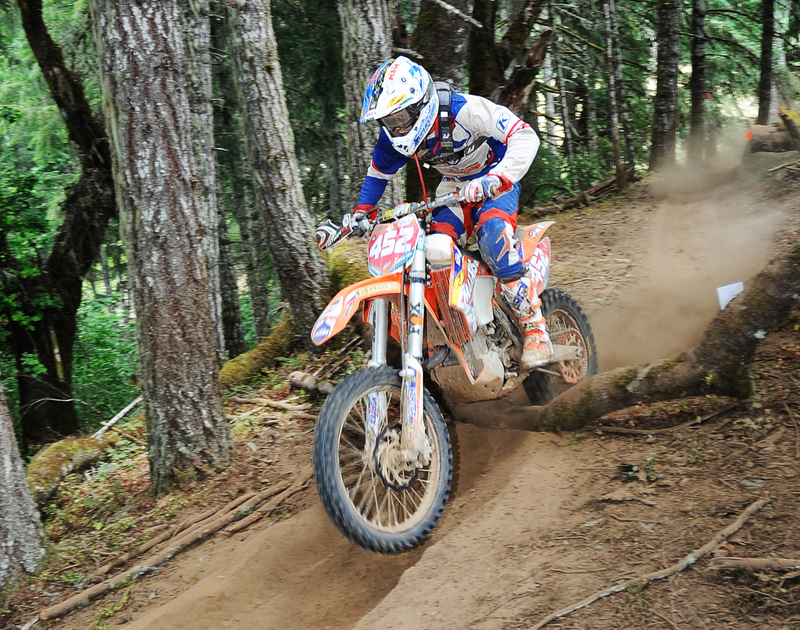 RPM/KTM’s Travis Coy would be mired in the pack after the start and would have to settle in the thick dust while he picked his way though the pack after a terrible start. He would battle his way from 8th on the first lap to being the final racer to take over the 3rd position and would run it all the way to the finish line. Burson would suffer the most after the terrible start going wide and struggling in the trees he would finish 11th overall handing 2nd place in the championship back over to Coy. “I knew I wouldn’t do well in the trees but with that terrible start it was going to be a long day. I ran into a tree hard on the first lap and lost my front fender and just did my best to stay in the points on the day.” Said Burson disappointed in his finish but looking forward to the final two rounds of the season. Steven Godman would put in his best ride to date after battling back and forth with Tucker Larrieu and Rory Sullivan and would be victorious finishing 4th overall just ahead of Larrieu. Sullivan would pull off after 4 laps with bike issues. Just behind Larrieu would be FMF Pro 250 victor Joey Fiasconaro who was in his first race after a serious injury sustained while practicing. “I just came out to salvage some points and I ended up getting the full 30! Can’t be happier with my finish today”. Fiasconaro would be followed by Justin McGovern and Chaz Halbert. Mcgovern and Halbert would battle all the way to the finish with less then a second separating them at the checkered flag. The TBT Women’s Overall is the only Guaranteed payout of the entire series and is always hotly contested! While Kalyn Benaroya would take the early lead Garrahan Off-Road Training’s Sophia Oliveira would take the lead and check out on the entire field. She would lead wire to wire and take the win and $100 over Sharon Mowell who would win $75 and Olivia Francis would would take $50.